Extend the leg, retract the lower leg. Extend the arm, bend the hips. 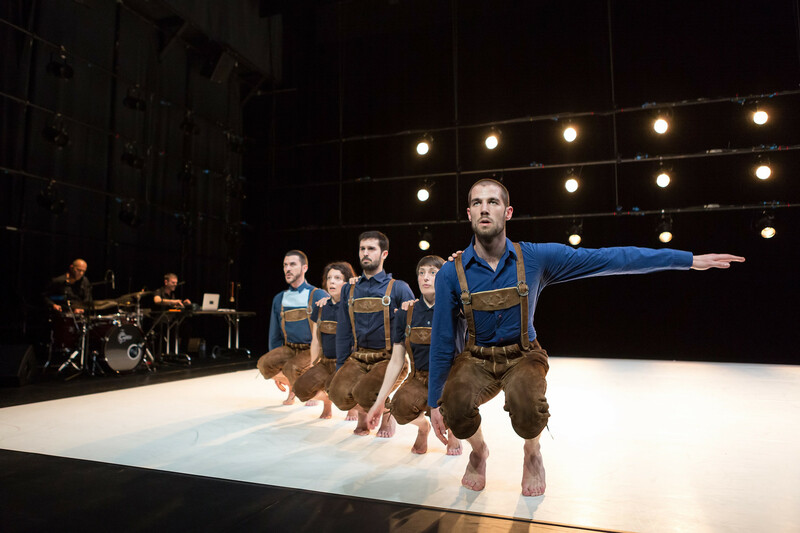 Accompanied by the whooping drum duo, the martial crew of Shake it out in lederhosen conjures the European process, presenting more than 200 flags as markers for folk dance steps between Eastern kazachoc and Western ceili dance. In a trio, Germany and France fight with Europe – and ultimately defeat it with the manoeuvring tiptoeing of the Irish Céilí dance. The cowbells from the Swiss Alps are coming to the rescue – but images from olden days flash up, and the ensemble huddles together. The Austrian Christian Ubl, who lives in France, used to be an award-winning standard dancer before he discovered contemporary dance. In 2005, after years with Angelin Preljocaj and Dominique Bagouet, he founded his own ensemble, CUBe, that creates movement out of images, music, architecture, and texts. Today, he performs in Tipperary as well as in London and Paris.